Ah … your lovely nightmare cute bizzare-looking Nendoroid Colossal Titan is finally available for pre-order! From the anime series ‘Attack on Titan’ comes a Nendoroid of the Colossal Titan that breaks down the walls that protect mankind! He comes with two expressions including a realistic expression that looks more like the face in the series, as well as a chibi expression designed for the Nendoroid! A special dioramic base made to look like the Shiganshina District including the giant wall and city are also included to recreate the epic scenes from the series! The Titan that ate Carla, a 15-meter class titan and one other secret titan are also all included as miniature Titans to help bring out the tense atmosphere. Miniature villagers and soldiers and even a broken wall are also included! 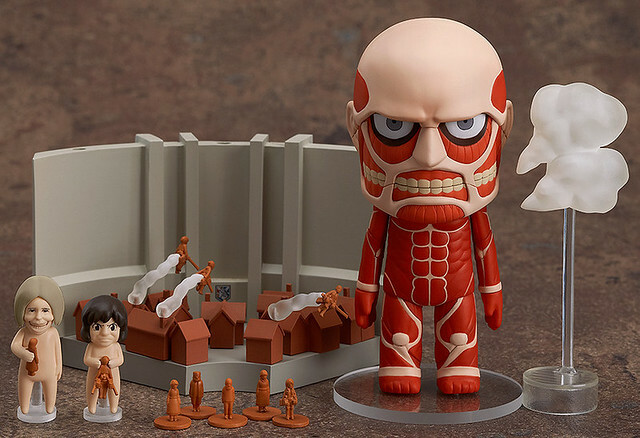 The ‘Attack of Titan’ world is coming to life in Nendoroid size for fans to enjoy! Nendoroid Colossal Titan & Attack on Titan Playset will be released on December, priced at 4800 Yen. Oh, and Kahotan, the one who replaces Mikatan to manage her blog, makes her first blog post today – and yes, she previews this Nendoroid set, so kindly pay a visit to the blog if you are interested to a bit more shots. This entry was posted in News and tagged colossal titan, nendoroid, shingeki no kyojin. This is creepy as hell. It just is. I’m certainly not going near this Nendo.